This plugin calculates the three orthogonal principal axes and moments of inertia around those axes. It includes pixels with values between upper and lower limits, which can be defined in terms of unitless grey values or Hounsfield units (HU). It optionally creates a new stack with the image centred and rotated so that the principal axes are parallel to the image stack's x, y and z axes. Calculations are limited to a rectangular ROI if one is drawn. The plugin will guess whether the image is HU calibrated, and if so, apply HU limits of bone (0-4000 HU), otherwise it will calculate auto-thresholds based on the stack's histogram. If a calibration curve is known, the coefficients can be added to get weighted calculations. 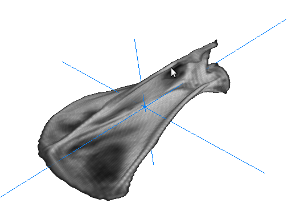 Aligning a bone with Moments of Inertia may be a useful step prior to Slice Geometry if bones are not aligned with the image z axis. This file last modified 0803hrs 28 July 2011 © Michael Doube 2004-2019 :: Designed to be interoperable and standards-compliant.